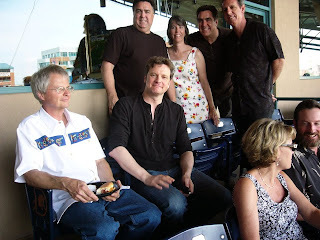 We invited him to throw out a ceremonial first pitch, but he politely declined...didn't receive any baseball training in the UK. 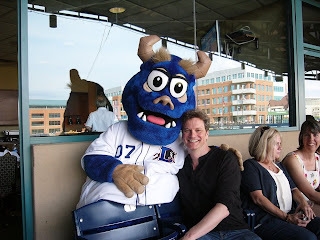 Still, Colin was interested in our National Pastime and joined us for the Durham Bulls/Columbus Clippers game on May 3rd. We presented him with a Bulls' jersey. 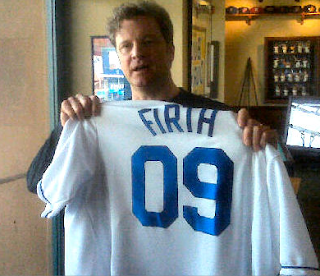 FIRTH is on the nameplate and 09 is his number. If he's inclined to wear it in London, maybe we will see a spike in our internet apparel sales from the UK? ...and you can click here for more "Main Street" location pix from a Colin Firth fan site.